Laurel and I met seven years ago…on the steps between our college apartments at James Madison University (go Dukes!). She was covered in paint, returning from the art studio. I was…well…I was just what you’d expect from a college guy who found himself talking to a girl out of his league. Psyched! We graduated together, moved to DC together, moved to NYC together, and are now pleased to report a solid first two quarters of marriage together. What recession? One of my dreams is to go heli skiing. I’ve already maxed out my LTD and Life Insurance through work…you know…just in case. I would consider relocating back to DC if my name got picked for Redskins season tickets (I’m on the waiting list). Seriously consider it. I have a mean Russian accent. Another sports one here, but this section is about me, so it’s ok, right? I have an active contract with Laurel that I will watch “The Notebook” with her if the Caps make it to the Eastern Conference Finals. Someone tell Laurel that’s a good deal for her. I didn’t even say win…I said make it to…big difference .Go caps! I’ve worn a mullet wig – in public mind you – in the past month. Don’t judge me. What happens on the blog, stays on the blog. 1. What would you say are the three most important things that you do to support Laurel in her creative endeavors? 1. Be 200% supportive. Anything less than that is just not enough. I’m not just talking about the big things either, like the “I’m-thinking-about-quitting-my-job-and-moving-to-New-York-are-you-in” idea, or the “how-do-you-feel-about-me-doing-a-6-week-outdoor-retail-show-in-December?” idea. I’m talking about the little things like the “I-had-this-dream-where-I-had-gold-and-silver-patterns-behind-glass-is-that-stupid?” ideas. I mean, these aren’t the kind of dreams I have, but I do think every dream of hers is worth exploring. She needs to know that I believe that. That’s my job. 2. Promote creativity. This may sound obvious, but when you think that we live in our office, it’s not as easy as you’d think. I recognize that in order for her to be creative, she needs to feel creative. And in order to feel creative, she needs to be in an environment that allows for creativity. This is why the only “man-thing” in the house is tucked away in the corner: an autographed Shawn Merriman football. I’m not even a Chargers fan, but I’ll take what I can get. 3. Help. I’ll qualify this first by saying that I’ve come to learn that she doesn’t need all kinds of help…like that time I tried to pitch that “man line” idea…what? She’s got that stuff down. But I am able to help with tradeshow booth set up. Let’s just say I know my way around a 10’x10’ booth probably better than anyone with a Shawn Merriman autographed football in his house. I can paper a wall in less than 15 minutes. I’m not sayin’, I’m just sayin’. 2. Being with someone who works long and irregular hours can be tough... from missed dinners to not being able to do simple things like relaxing and watching your favorite shows together as often as you'd like... How do you stop the craziness from impacting your relationship? Can you please offer some survival tips for those in similar situations? 1. Don’t sacrifice time at the gym. Whether it’s the yoga studio for Laurel, or God’s gym (as I like to call running outside) for me, as soon as you let exercise slip, you lose the ability to cope/deal with stress. Working out is often the only outlet. Even if it means you don’t eat until 10pm some nights, so be it. We both push each other to maintain our fitness routine. No, it’s not easy to do, especially in the winter, but it’s a game-changer. 2. D. V. R. Are you serious? There’s no way – or reason – to guarantee either of us will be home in time to watch any show on any day. And there’s not a chance we’re going to miss the latest and greatest of Lost, The Office, 30 Rock or Friday Night Lights. Why stress about it? With DVR, you don’t have to. Your favorite shows are just a click away. Copyright 2009 Jedd, people! 3. Make time to laugh. If you’re not laughing at that Sham-Wow or Snuggie ad, quite honestly, you’re not living. 4. No time for complaining. You know what? Work can be challenging – that’s why it’s called work. Fortunately, we both know that, and realize that there will be good times with challenging times. And we both realize you have to work for what you want, even if you don’t know what it is. With that perspective, we just try to go one day at a time, and keep on with #1-3 above. Yes, space is very much a luxury around here. But I think we hit the jackpot with our spot – it’s got a storage attic. I’m not talking your typical pull-down-the-latter attic with some two-by-fours you can lay some boxes across. I’m talking walk-in, fully reinforced, 10’ ceilings, 200sq. feet of genuine extra space. It’s loaded with Laurel’s work gear, and a few of my prized items from bachelorhood I refused to toss. Ok, maybe I hid them there. 4. What was the strangest thing you've done to support Laurel in what she does? Outside of picking up and moving life to NYC nearly four years ago…umm…let’s see. I found myself drawing a flow chart to help her think about the production process. She told me it helped. She still has it – couldn’t be that bad, could it? 5. What is the easiest and hardest thing about being Laurel's other half? The easiest thing is that I don’t have to worry about buying her jewelry! Wait, I know what you’re going to say, so I’ll stop you right there: I’m not the guy who is never going to buy her anything. I mean, diamonds are a girl’s best friend, right? But for the most part, the day-to-day jewelry is handled, and that’s a good position to be in. The hardest thing for me is seeing her frustrated. Sometimes, you just get stuck with a bad day. But, it’s hard to see your other half frustrated, because it’s more than just work to her – it’s an extension of her, so it hits harder. It doesn’t happen often, and she knows she has a supporting cast behind her, not just me, so I think that helps. Also, she sometimes makes fun on my drawings when I try to articulate a point. Why do I draw? 6. Please choose one of your personal favorites from Laurel's collection and briefly explain why it's your favorite. She calls it “Thinker Bird”. I call it “Ridiculously Sad Bird”. Seriously, that’s the most depressing piece I’ve ever seen. I call it my favorite because I tease her about it all the time. How is it that someone so happy could create such a sad piece? What’s more, people love it. It’s one of her most popular pieces. Maybe I’m just a crazy bird. Thanks, Melissa! And thank you, Marichelle! 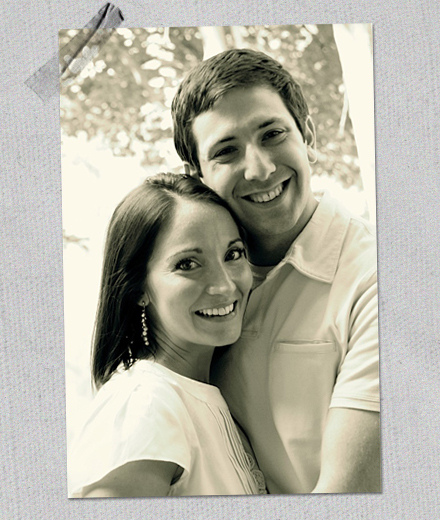 So sweet to see Jedd on one of my favorite blogs and read his answers - what a lucky gal I am! This is by far one of the cutest other half interviews!! what a cute article! My husband and I have little bit of a similar story...he was probably helping me thread the loom or talk me off a cliff about the cruddy computers in the lab eating my zip disk again in Duke Hall at JMU 7 years ago!